GableVision provides world class digital signs and media solutions. 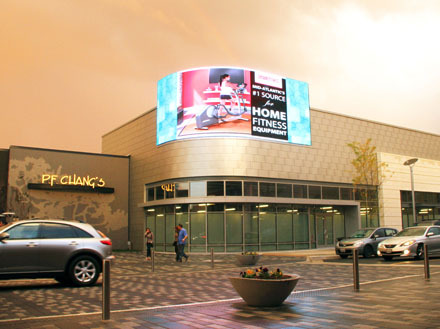 When working with Stonebridge at Potomac Town Center to create a large 45’ x 15’ LED video wall, GableVision wanted to ensure the system could handle multiple video and audio source displays. Cenero worked closely with GableVision to bring this video wall to life. By implementing a multi-window processor, up to 4 separate video windows can be displayed on the wall at one time. Strategically placed source input plates make broadcasting live events easy and seamless. Cenero included a monitor near the equipment rack that allows users to preview content being sent to the LED wall. In addition, all-weather speakers were placed throughout the shopping center so music from a nearby restaurant can accompany the video on the wall. A control system with a Cenero designed user interface provides easy control and operation of a sophisticated multi-media system with the push of a button.